PASADENA, CA--(Marketwire - July 10, 2008) - Vision.org publisher David Hulme examines the subject of rulers who style themselves as deities. In his article "Men as Gods," the first in a 10-part series newly revised for the journal's latest issue, he writes, "men who delight in playing god until they become a god have long been part of human society, and often at the leadership level. 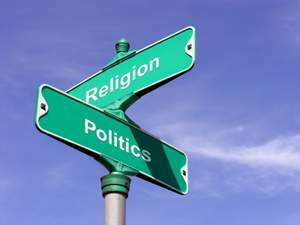 Politicians who use the power of religion to sway and enslave others are not uncommon." Americans grow up believing that Church and State should be separate entities. Indeed, the First Amendment to the U.S. Constitution states that "Congress shall make no law respecting an establishment of religion, or prohibiting the free exercise thereof." Nevertheless, polls indicate that most Americans consider it appropriate for a president to have his own religious beliefs, and many approve even when he speaks publicly about them. Both President Bush and presidential-hopeful Barack Obama have made public expressions of their faith, and both have faced their share of accusations of implied claim to divine approval. Fortunately for both, most Americans don't seem to mind when their leaders believe they are approved by God. But would they mind if a president claimed divine appointment to the role or if he took the next step and professed divinity for himself? In modern times, such a scenario seems impossible to contemplate. Historically, however, it is one that has been repeated with surprising regularity. Religion and politics have traditionally been more inseparable than we may be accustomed to in modern times: history is replete with men who would be gods. One needn't go far back in history to see the truth of this statement, and even atheistic societies have fallen victim to men who set themselves up as saviors. Hitler, Stalin, Mussolini, Mao Zedong and Pol Pot. For these men special appointment grew into divine right and eventually divinity itself. In each case, promises of Utopia dissolved into cruelty and destruction for large segments of their populations. Of course, as Hulme notes, men like these have plagued civilization for millennia. Even the Roman emperor Nero was not the first ruler to view himself in divine terms. "Emperor worship inherited some of its concepts from the ancient East," he writes, "where kings were considered sons of the gods." In "Men as Gods," Hulme explores some of the intriguing early examples of rulers who reach for messiah status by manipulating their subjects until they achieve dictatorial control. Most fascinating, however, is the realization that this theme has repeated itself throughout history, despite the fact that historical accounts are no secret to the very populations who fall under the sway of successive dictators. Of course, here in America we value our freedom far too much to give power to any such self-appointed savior by being careless about the relationship between religion and politics. But there will always be a ruler somewhere willing to misuse the office entrusted to them. At least, that is the lesson of history. Perhaps it's a lesson that should be often reviewed. Vision.org is an online magazine with quarterly print issues that feature in-depth coverage of current social issues, life and health news, history, family and relationship issues, including insights into philosophical issues, and morals and ethics in society today. For a free subscription to the Vision quarterly magazine, visit their web site at http://www.vision.org/visionmedia/default.aspx.